While I’m over at Magical Words today talking about Authenticity of Voice, I’m pleased to host Amanda Ashby here, talking about her great new middle-grade novels. 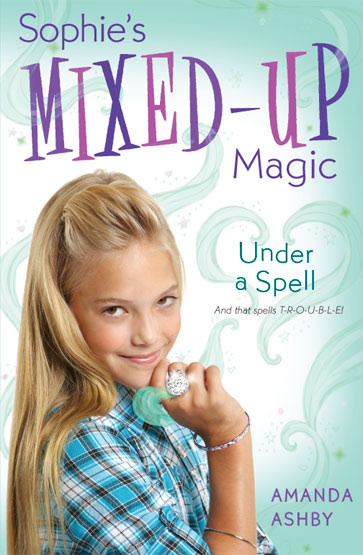 Puffin has brought out the first two books in her Sophie’s Mixed-Up Magic series simultaneously, so readers can jump right into her world with WISHFUL THINKING and UNDER A SPELL ! Plotting! I get so many ideas that it’s not funny and I really struggle to put them altogether and find the story. I often feel like I’m doing a jigsaw puzzle and half the pieces are missing. Thankfully Diet Coke gets me through the worst of it! Did I mention that my heroine is a djinn with magic powers? However, if she wasn’t allowed to use her powers (though I suspect she would be because hello, if deserted island doesn’t constitute an emergency, I don’t know what does) she would take her Eddie Henry guitar pick, which she got when she saw her favorite band, Neanderthal Joe in concert. 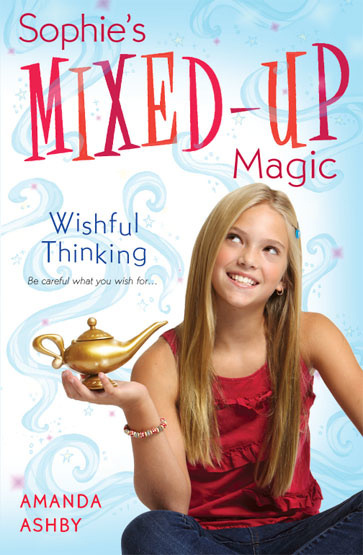 She would also take a bag of Cheetos for her djinn guide, Malik and finally she would take her favorite positive thinking book, just to remind herself that being stuck on a deserted island is just a lesson in the making. Look for her third Sophie novel, OUT OF SIGHT , in October 2012! What a great interview! Sounds like a great read!